Vacant publicly-owned property or portions of existing parks around New Orleans could become as many as 20 new fenced-off play areas for dogs, officials told Uptown residents at a meeting Wednesday evening. Until the opening of the fee-based “City Bark” dog park at City Park in 2010, dog owners had nowhere they could legally take their pets to run without a leash in New Orleans, leading to the common use of other parks as “unofficial” dog parks. Other residents have complained about that practice, saying that some dogs attack or intimidate children or even smaller dogs, or that they can be hit by passing cars outside parks without fences. In response, the city’s capital projects department and the New Orleans Recreation Department are now trying to two new official dog parks and two dog “runs” in each of the city’s five council districts. According to a presentation Wednesday night during a public input session on the plan, they define a dog park as a fenced-in area larger than an acre with running a water fountain, shade, waste stations, seating and walking paths, while a “dog run” is smaller than an acre, with all the same features except the running water. None of the locations have been determined, but city officials are looking for publicly-owned land away from sensitive areas such as schools or hospitals on well-drained land with a water line nearby. Further, they would prefer it be near one of the areas already being used as an “unofficial” dog park, said Katie Dignan of the city’s capital projects team. In some cases, such as the Fly behind Audubon Park, officials may choose to carve a piece out of an existing park for dogs. In other cases, they are looking at vacant lots — many of which are owned by public entities such as the Housing Authority of New Orleans, for example — that could be easily converted into dog parks. A number of properties around Uptown that fit that description exactly are being studied: 1.8 acres at 5200 Tchoupitoulas (next to Dufossat), 0.75 acres at 3249 Tchoupitoulas (by Pleasant), .28 acres at 1018 Melpomene (by Constance) or 4.4 acres at 1542 Constance, near the Kingsley House. Residents were invited to give written comments on the merits of each site or suggest new locations, and officials said they hoped to sift through the responses and make formal recommendations within a month. The city budget has no money for these parks this year, however, so 2013 would be the earliest construction could begin. Reaction to the plan Wednesday night before a crowd of several dozen people at Latter Library was mixed. Some used the meeting to complain about the current lack of enforcement of leash laws at existing parks. One man complained that the plan will reduce the number of people walking their dogs to local parks, reducing the extra eyes on the street that dog owners represent. But others, such as Dan Fribush, were thrilled by the idea — Fribush said he currently takes his dog to the Lyons Center, but has long thought the site at 3249 Tchoupitoulas would make a better location, and was glad to see it as one of the city’s suggestions. “I couldn’t be happier,” Fribush said. A significant number of residents at the meeting, around 15 or so, came from the neighborhood near Wisner Park. The Friends of Wisner group that has spearheaded the installation of a playground and tree plantings there conducted a survey on the issue that found that 83 out 93 respondents supported some sort of dog activity at the park, and that most of of those would be willing to help raise more money for a fence to dedicate part of the property there to dogs. Dignan noted that Wisner was the third most-used park in the city by Uptown dog owners, after much larger spaces at City Bark and Audubon Park. Most people who use Wisner Park have both dogs and kids, so the play areas for children and room for dogs are both important to them, said Sam Winston, a Friends of Wisner member. They have already met with the city multiple times seeking permission to begin fundraising for the project on their own, and are simply waiting for a positive response to move forward, Winston said. “When you have something that’s already working, it would be a mistake to break that up,” Winston said. 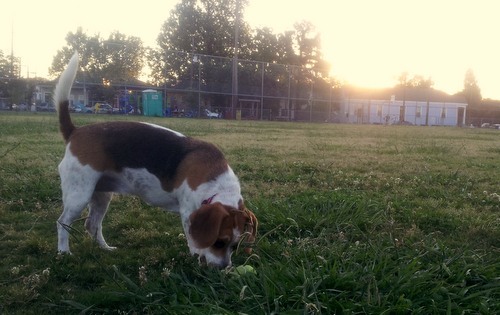 After Wednesday’s meeting, as the sun was beginning to set, only one dog owner was in Wisner Park. William Thacker, a Peniston Street resident, was tossing tennis balls to his beagle, Maggie, in the outfield of the empty baseball diamond. Thacker said he worried that dedicating any portion of Wisner Park to dogs would limit recreation opportunities for children, and said he would prefer to take Maggie to a completely new park somewhere else. To read our live coverage of Wednesday’s meeting, see the box below.